Our lodge of nearly 800 members welcomes all visitors. The Antler Lounge is a smoke-free facility featuring a full service bar, pull tabs, shuffleboard, darts, pool, 5 flat panel TVs, music and more! A dinner special is featured on Tuesday at 6:00pm from Sept thru Dec and again Jan thru April; and snacks are always available. Lounge hours are 11:00am to 11:00pm Monday through Saturday and 1:00PM to 6:00pm on Sunday. Hours are at the discretion of the bartender on duty. General meetings are held on the 1st & 3rd Wednesdays on each month begining at 7:00pm, except in July and August when there is a meeting only on the 3rd Wednesday. Initiation is held with the 3rd Wednesday meeting. 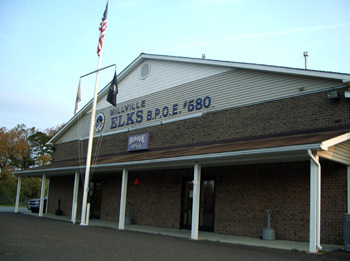 Our Lodge is located at 1815 E Broad Street, Millville, NJ. Please refer to our calendar for information on dinner specials, bingo, karaoke, social events and more! Bingo is held in the Lodge Hall each Thursday at 7:00pm. $1,000 cash prize for the last game each night!